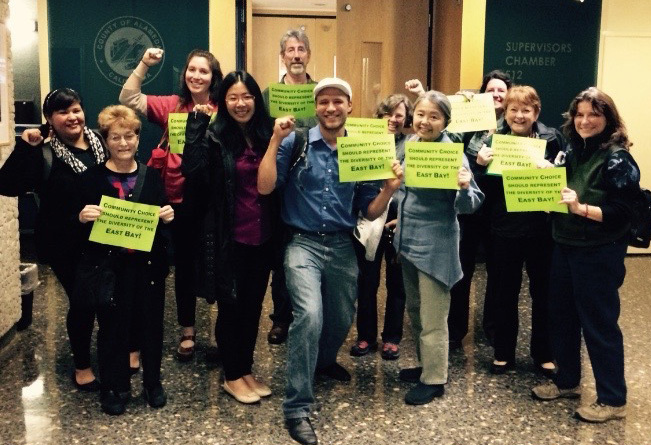 We are on a winning streak; on same week of the Warriors Championship, the Clean Energy & Jobs Oakland Campaign won a unanimous vote by Oakland City Council on a resolution for Community Choice Energy with benefits to address social and environmental equity in the East Bay. The resolution emphasizes economic community benefits with an emphasis on the need for prioritizing low-income and communities of color, in addition to clean energy production and fighting climate change. The resolution specifically calls for the building of local and in-state renewable energy, which creates fair-wage jobs for the East Bay community. In the light of an economic and housing crisis, the resolution emphasizes, “providing as much of this work [as possible] under Project Labor Agreements (PLAs)” PLAs are also known as, “Community Workforce Agreements,” which is an understanding that the jobs created to build local clean energy projects; will prioritize unionized labor. This is a great feat, considering that much of the green energy industry thus far, has not traditionally been union work. Community Choice Energy in the East Bay could set a precedent to unionize the green energy sector locally. The clean energy economy has not traditionally benefitted low and moderate income residents, persons of color and renters. From Community Choice energy we stand to gain affordable and stable rates for electricity for our homes and businesses. The resolution calls for incentives for those who want to own renewable energy projects as well as create opportunities for people who do not own their home to benefit from community controlled and owned renewable projects. Oakland is now in the midst of a fight against coal transports and the greater East Bay fighting fracking, in a time when we know better. The community benefits of clean energy that we stand to gain from Community Choice Energy are long overdue. The day after the passing of the Oakland City Council resolution, the Alameda County Community Choice program; the East Bay Community Energy (EBCE) steering committee (an advisory body) for the Alameda county Community Choice program) held its first meeting. The committee is made up of various community persons from non-profit organizations, co-ops, labor, individual ratepayers, agencies and city representatives. The first task of the steering committee is to finalize the RFP (Request For Proposals) on a feasibility study. The East Bay Clean Power Alliance has submitted comments to the Alameda County Planning staff to request that additional studies (both short and long-term)to address local build-out and a sustainable business plan. The East Bay Clean Power Alliance pushed back on the county staff and consultants whom intended to get the EBCE steering committee’s blessing that same night to finalize the RFP. The East Bay Clean Power Alliance is committed to the goals of local buildout; local jobs creation in addition to other community benefits and will not allow a project that leaves us in the dark. The next EBCE steering committee meeting is July 16th 7:00pm, location TBA and open to the public. As members of the Local Clean Energy Alliance, we will update you and call on you to support us by calling and/or emailing your county Supervisor in support of a true Community Choice Energy program which would require additional studies (in addition to the feasibility study) to ensure that the East Bay Community Energy program works for the communities of Alameda county.